The new Agilent catalogue 2013/2013 is available. You can order the catalogue here or download the electronic version. Our deuterium lamps are subject to rigorous quality control checks and are delivered with an individual certificate. We do not only sell our lamps, but we have 20 years experience in their perfect pre-alignment. Our lamps come with a 1000h (longtime series) or 2000h (DURANIUM™ series) lifespan guarantee. The DURANIUM™ lamps have also a higher intensity and higher base line stability. The new timer (RoHS conform) replaces the old type (with Mercury inside). Due to the compact size it can be used for nearly every deuterium lamp. The Microlab 600 is a highly precise syringe pump with a graphical user interface designed to quickly and easily dispense and dilute liquids. This positive displacement system provides better than 99% accuracy, independent of a liquid's viscosity, vapor pressure, and temperature. 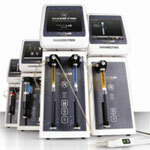 The inert fluid path minimizes sample carry over and improves compatibility with harsh chemicals. 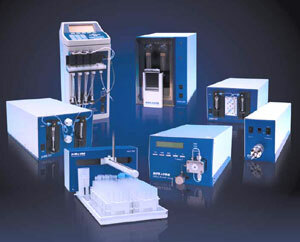 The main devices in the field of liquid chromatography (autosampler, pumps, detectors, degasser, column switching, thermostated column compartments) and liquid-handling (dilutor, dispenser, flowmeter) could be found in the instrument catalogue.